When we think of an image of an American cowboy from the 1800s, we think of a clean-shaven face. Maybe with a mustache, but very rarely with a full beard. There are two reasons that we picture cowboys that way - the reality and the Hollywood version. And they both have the same thing in common - photography. Of course we all know the Hollywood version of the classic cowboy - clean shaven, white hat, that sort of thing. Mostly that is a reflection of how men looked in the 1940s and 50s, with the invention of the safety razor. In the 1800s, men didn't have that piece of technology, and only the people who were willing to spend money could get a clean shave. Even at two bits, it was still money! And you could get a decent meal in those days for a quarter. Why waste it on a shave? The reason that we see authentic photos of most cowboys clean shaven is because they are all cleaned up for their photograph. Getting a photograph was a big occasion back in the 19th century, and it cost real money, so it was time for a shave and haircut - even if it was expensive. 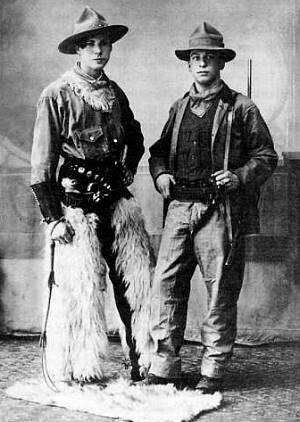 And another thing that you have to consider is that most cowboys were boys - that is, teenagers. Most men, myself included, can't really grow a decent beard until into their twenties. Better to shave it off until you're older.